The most famous face in cricket has had his book republished courtesy of Amberley Books. The legendary cricketer who scored 54,211 runs and took 2,809 wickets has burst on to the scene again in this enjoyable and quite often entertaining historical account. The book is one of a series of Classic Guides to sports including football, tennis and sailing. Having read many older cricket books, the polite way is to say that cricket writing has changed over the years but the good Doctor's writing is far from drab. Maybe the cover photograph portrays a less than solid defence but, as he writes during the book amongst the coaching tips, it inevitably tightened up as the ball came closer and enabled him to score such a vast number of runs and become the celebrity figure which his cricketing prowess gained. Starting off with a history of the game dating back to 1300 – well, there's a thing: did cricket really exist that early? – Grace also writes about his family. Female readers may not be enamoured to read that Mrs.Grace, in the true fashion of the times, prolifically raised nine children which W.G alludes to: five brothers with full names and dates of birth given before a cursory ending of "... and four girls between Henry and myself." He does at least credit his mother as knowing how to play as well as his three elder brothers. It is interesting to read the Laws as they stood in 1891 and W.G's take on fielders and fielding, many of which still hold good today. Mid-On was even then considered an easy position to field but mercifully Long-Stop, even in the late-nineteenth century, was becoming a position of the past due to the improvement in wicketkeeping. Lest we think that fast bowlers bowling slower deliveries is a comparatively recent phenomenon to stop hard-hitting T20 batsmen, read his account of legendary fast bowlers Fred Spofforth and George Lohmann. The Doctor writes knowledgeably about the cricketing sides including Australians, M.C.C, University and First-Class which he played for and against and it is perhaps surprising amongst these pages to find a list of M.C.C presidents and results of Oxford and Cambridge matches. He also gives a very modest record of his achievements. Remarkable figures both batting and bowling which, even allowing for the vast number of games played then, are still breath-taking in any era. Stories of W.G. Grace are legendary but, alas, none were likely to appear in his own book. The "artful old toad" as he has been described in other books, may have been credited for telling an umpire that the crowd had come to watch him ( Grace) bat and not the umpire to officiate and told another umpire that it was windy one day when dismissed bowled and promptly putting the bails back on but, looking at the 1891 Laws, maybe the umpires had to watch their backs as Law 52 stated that "...no umpire shall be changed during a match, unless with the consent of both sides, except in violation of Law 51 – no umpire shall be allowed to bet – ; then either side may dismiss him." 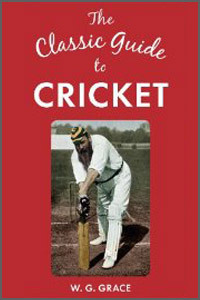 Amberley are to be congratulated on reproducing this most enjoyable book and giving readers an insight and comparison to how cricket was played just before the Golden Age and when county cricket started and began to flourish.